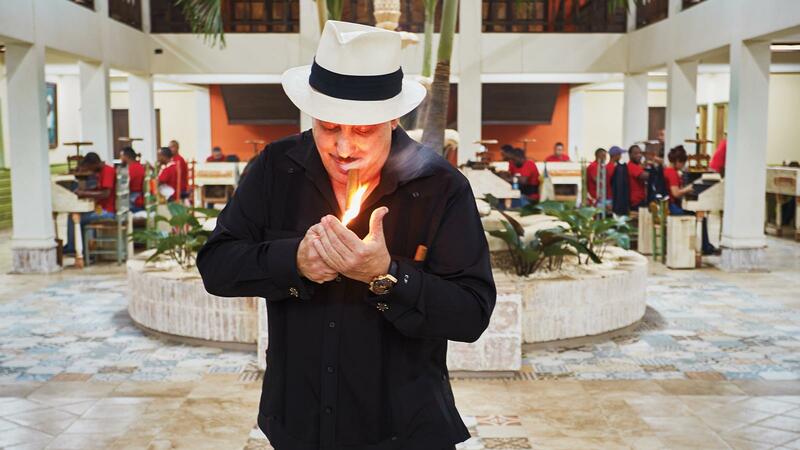 Carlos “Carlito” Fuente Jr. lights up in front of the fountain in his grand courtyard factory. Referred to as “the cathedral of tobacco,” the beautiful two-story space is a fully functioning cigar-rolling gallery. 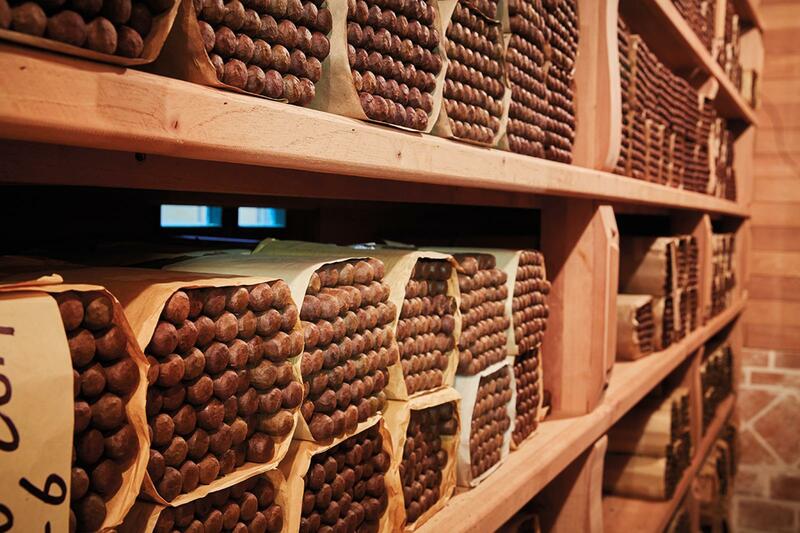 There’s nothing like it in the world—The cigar world anyway. It may sound like hubris or like some second-rate promotional cliché, but in this case, it happens to be true. And now, cigar lovers have a new item to put on their bucket list: a tour of the new Fuente Factory. It’s a rainy winter afternoon in the Dominican Republic and Carlos “Carlito” Fuente Jr. hurries into the office of his factory, holding, of all things, his dry cleaning. There’s a photo shoot on the schedule, as well as an interview, but Carlito has other plans. Almost on cue, a crack of thunder outside punctuates the finality of his words. Fuente’s jet-black hair, groomed mustache and Panama hat give him the classic, silver-screen look of someone like Errol Flynn or Clark Gable, only Fuente seems preoccupied at the moment. It’s been unseasonably rainy in the Dominican Republic with violent downpours every day. He takes a sip of coffee without sitting down. Outside, the rain comes down harder, and somehow, right within the confines of his own office, Fuente disappears. Just like that. Trap door? Secret exit? No matter. It seems his mind is made up. There will be no pictures. Then, Fuente rematerializes outside of his office and walks back in the way he came, this time a little less anxious. Wherever he vanished to, he’s now reconsidered. He has a Fuente Fuente OpusX in his hand, which he lights. The smoke wafts around his face, briefly trapped by the brim of his hat. It starts with a cigar factory, and for most of the cigar world factories are simple places of business, strictly utilitarian, typically consisting of nothing more than rows of rolling tables set up in a warehouse or nondescript industrial space. Under normal circumstances, the best you can hope for in such places is a clean environment and good lighting. Fuente’s factory, Tabacalera A. Fuente y Cia., has been simply that for much of its long life. Fuente Jr. and his father, Carlos Fuente Sr., came here in 1980 seeking a new home after their factories in Nicaragua and Honduras burned to the ground. They set up shop quite modestly in the first free zone in Santiago, known as Zona Franca No. 1, an industrial park that allows manufacturing (cigars and otherwise) for export only, at a low tax rate. 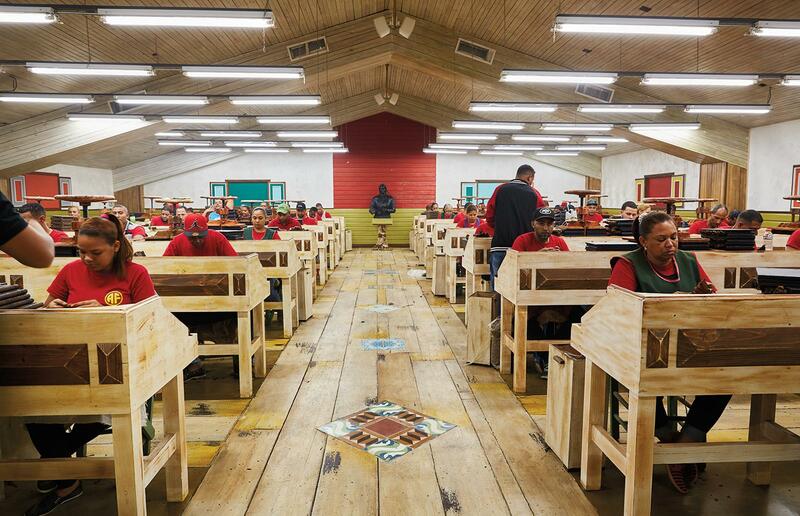 Over the years, the Fuente footprint has grown, and today the Fuente complex in Santiago consists of four separate facilities within the free zone, where 30 million cigars are produced each year, entirely by hand. Some of them are contract brands such as Ashton and Diamond Crown. About 700,000 (a mere 2.3 percent) are Fuente Fuente OpusX. Efficient and productive, the factory has served Fuente well over the past 38 years, but starting in 2015, Fuente Jr. began remaking it, from top to bottom. 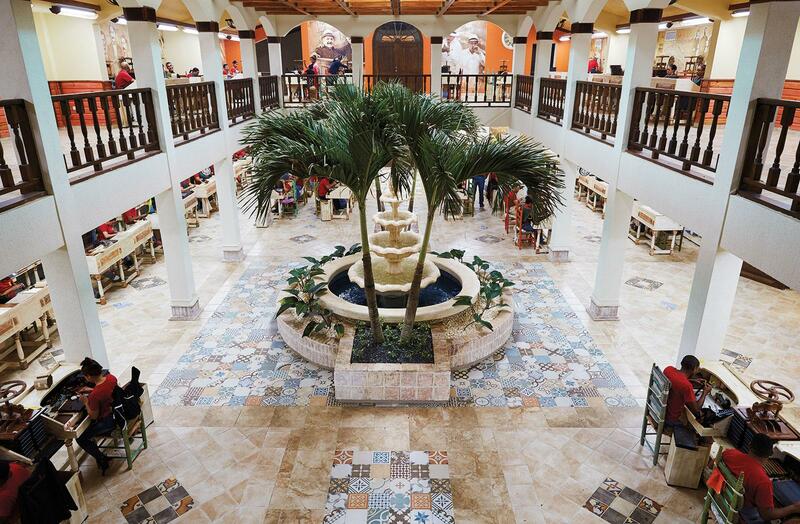 The main lobby of Fuente’s new factory is welcoming and ornate, laid with decorative tiles flown in from Spain and Italy. It’s one of two reception rooms that lead to the main courtyard and is filled with art and memorabilia. Fuente has envisioned this grand and beautified operation for quite some time. Now, the dream has taken shape in the form of a palatial courtyard and massive expansion that’s tripled the size of Fuente’s Tabacalera A. Fuente y Cia. main facility. “There isn’t a square inch of this place that doesn’t symbolize something,” Fuente says. He’s not exaggerating. While there’s an obvious grandeur to every new room, there’s also a story. Decorative tiles and ornate masonry are laid like literary allusions to the larger narrative—Fuente’s cigar empire. Some of the details are subtle, some are more heavy-handed. Either way Fuente doesn’t want you to merely see each new space. He wants you to experience them. To feel them the way he feels them. Much like his cigars, the new factory is as much an emotion for Fuente as it is an edifice. Take, for example, the lush and airy central courtyard. It’s the crowning jewel of this massive expansion, and for Fuente, it’s a tribute to his roots in Tampa, Florida, the cigar-making city where Fuente is headquartered. Based on the classic Columbia restaurant in Tampa, the two-level courtyard is referred to as the catedral de tabaco—cathedral of tobacco. The cathedral was built with its own lavish lobby. Where most cigar factory entrances are quite unceremonious, this one serves as a prologue for the story that’s about to unfold. After that, you walk through double doors to another antechamber for reception. The tension builds, and then the crescendo peaks as you walk into the courtyard and behold its dramatic beauty. A central fountain and some palm trees are, naturally, the first details that blossom into view. (No surprise. The name Fuente means fountain in Spanish.) From there, the rest of the two-story gallery takes shape. Cigar rollers on the ground floor are situated along the courtyard’s perimeter. On the arched upper level, more rollers overlook the fountain while a skylight adds to the airy affect. For all its architectural drama and productivity, the courtyard is tranquil. The fountain cascades softly and the cigar rollers seem as relaxed as they are focused. Fuente Jr. walks across the tiled floor to a roller and points out a mural on the wall behind him with an old photo of company founder Arturo Fuente. “You see that? That’s my grandfather,” Fuente says. He stares at the photo for a moment and then moves on. “There’s still so much to do,” he adds and hurries up the stairway. On the other side of the courtyard, situated on the second floor is the new barrel room. At this point, it is not yet in full operation. Rum barrels line a far wall and there’s space downstairs for more. The barrels are for tobacco, and this is the room where Fuente plans to barrel-age tobacco for every cigar he makes. He doesn’t plan on merely having a room full of barrels. That would be boring. And that just wouldn’t be Fuente. In addition to all the tobacco barrels, he plans on creating a barrel carousel of sorts in the middle of the room. More like an interactive Ferris wheel, but instead of passenger pods, it will contain barrels, each with a different tobacco. This way, a user can spin the wheel and examine the different tobaccos by smell, by sight, by touch. At the time this article went to press, the wheel was only in blueprint form, but there’s no reason to think that this won’t become a reality. When Fuente has an idea, no matter how unusual, he seems to follow through. Comparisons to Walt Disney would be understandable. Fuente has created a beautiful, fantastic environment, and, like Disney, he aims to bring some wonderment to the cigar world. But that isn’t the right comparison. Disney implies a sense of make-believe, while what Fuente does is quite real. Willy Wonka might be a more apt comparison. Like the mythic chocolate factory, few people get the pleasure of actually going inside. Rather than chocolate, Fuente churns out unique smokes that have one of the largest, most passionate fan bases in the cigar world. And like Wonka, Fuente is always experimenting—and also a bit reclusive. Lately, Fuente sightings have been rare, and he’s still very guarded as to who he does and does not allow into the factory. During the ProCigar Festival, when all the participating members open up their factories in the Dominican Republic, Fuente, instead, diverts the tour to his tobacco farm, Chateau de la Fuente, miles and miles away from where his cigars are rolled. Of course, Chateau de la Fuente has a magic all of its own, and is no less breathtaking or important. Yet even some of his biggest fans have never set foot into Tabacalera A. Fuente y Cia., let alone even seen it. Getting to the factory isn’t exactly a mystery. Once you get past the gate, the free zone looks as drab as any other industrial park. Then, as you get closer, you see some landscaping. Then the property becomes more florid and lush—a true oasis among the grim landscape of warehouses. Making the outside beautiful was always part of the grand plan. In order to expand, Fuente took over the existing buildings (former textile facilities) all around the main factory. There was one behind him, one to the left and one to the right. They’re all under his control now, and have been seamlessly joined together, albeit in a labyrinthine kind of way. Perhaps this was by design. Anyone familiar with the previous layout would be completely disoriented because so many things have been rearranged. The stripping and sorting areas have been moved to a larger space. So has the packing room. The aging rooms have their own corridors. All core-line Fuentes are produced in the “cathedral,” which, as mentioned before, has its own lobby, antechamber and front entrance. Production of the Don Carlos brand was temporarily diverted to other rolling sections but now, the new Don Carlos room is complete. The room is a tribute to the brand and right next to it, Fuente is building a casita, which means a cottage, or little house. It’s a replica of the house he grew up in in Tampa. Fuente is eager to show it off, and it is indeed a quaint little structure with its corrugated metal roof, but he was unclear as to its functional purpose outside of it being an exhibit. “I have so many plans. I’m going to see about giving different brands their own aging rooms. That way I can micromanage the aging of every cigar,” Fuente says excitedly. Fuente’s new Columbus room is dedicated to Christopher Columbus, the explorer credited with bringing tobacco to Europe. It’s one of many new spaces in the expanded factory. The aging rooms have their own wings. Two halls flank the main walkway, and the rooms are unusually ornate. Understand that most factories have a single warehouse-sized space to serve as the aging room. Again, the orthodoxy of cigar manufacturing doesn’t apply here. The norm means nothing. Fuente has constructed room after room to age different cigars in different conditions. 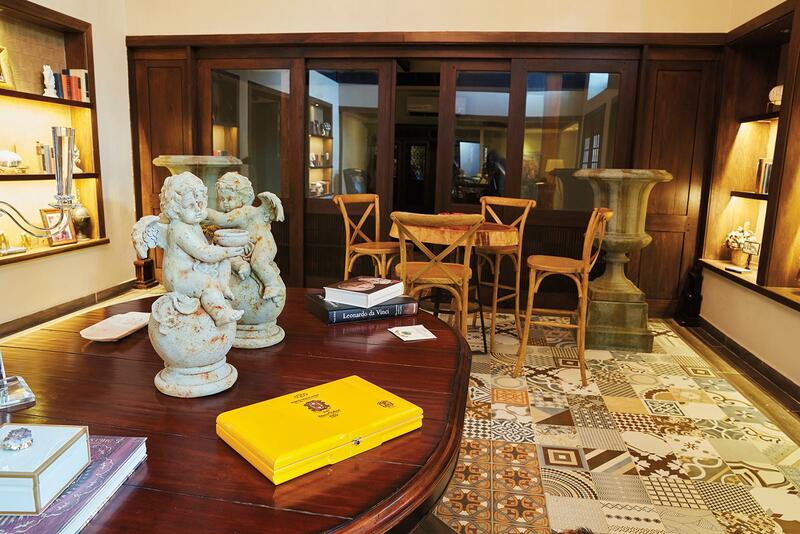 Naturally, the aging rooms have an ambience and dignity of their own—floors are paved with picture tiles imported from Spain and Italy, the walls adorned with decorative brick work. Despite all the changes, some things are staying the same. The aging rooms for both Don Carlos and Fuente Fuente OpusX are not being touched. Neither is the OpusX rolling room, where OpusX is made. “That was not negotiable,” insists Fuente, who sees no need to alter something simply for the sake of change. What was sacrosanct in the past stays sacrosanct. Unlike Fuente’s other aging rooms, where cigars are exposed on shelves, all Fuente Fuente OpusX cigars are shut in by cabinets. Other rolling rooms are also staying the same. The Hemingway Room, where Hemingway brand cigars are made, isn’t changing either. Nor is the room where Don Carlos Eye of the Sharks, Cigar Aficionado’s 2017 Cigar of the Year, are made. Only two people make that size, regardless of the high demand. That room, Fuente says, isn’t going anywhere. 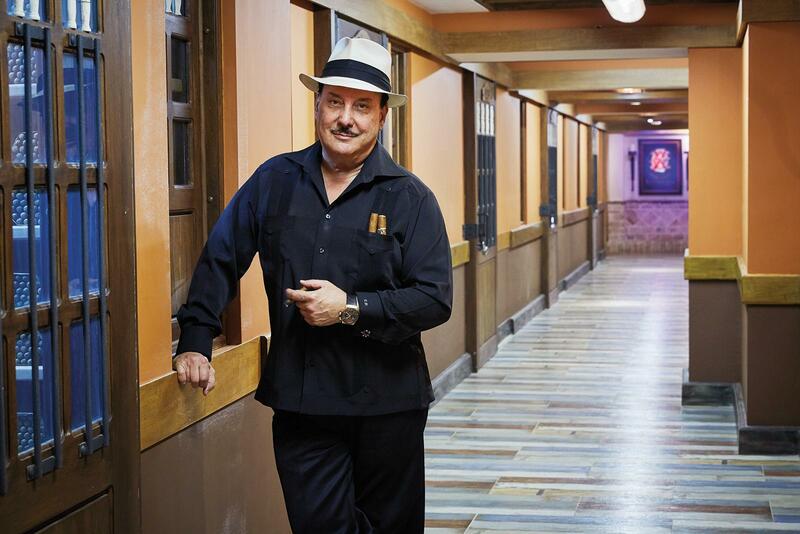 Carlos “Carlito” Fuente Jr. in a new hall dedicated to aging rooms. While Christopher Columbus might be vilified in the United States by a few activist groups, Fuente is honoring him. In another new wing, he’s created a rolling gallery called the Columbus Room, which has about 50 rolling tables. The other facilities located in other parts of the free zone have been left alone. For the time being, Fuente’s focus is on the main compound. Even though he’s created so many new rolling rooms and invested in such a buildout, Fuente isn’t really expanding production in any significant way. By the end of the year, he’s only looking to increase production by about 5 percent. As to how much all of this cost, Fuente didn’t commit to a number and merely shakes his head at the question. He might not even be totally sure, but such things seem inconsequential. The sheer force of his personality suggests that cost is unimportant and completion is inevitable, no matter the dollar amount. If the confluence of beauty and function are the indication of an enlightened civilization, then Fuente is, once again, ahead of his time. Recall how he defied the skeptics of the cigar world by growing wrapper in the Dominican Republic. And how he used that wrapper to create the strong and powerful Fuente Fuente OpusX when there was no demand for spicy, full-bodied smokes, not to mention the unprecedented demand for the OpusX at the time of its release. In retrospect, OpusX is only a part of the story. Cigars rest inside one of the many new cavernous aging rooms. Through the twists and turns and cavernous corridors, Fuente points out the onsite medical center he’s building in the event of workplace injuries. Eventually he circles back to the main lobby and points to an empty room. Fuente’s toying with the idea of serving dry-cured meats and cheese in there. It will probably happen. On the walls hang paintings of his father, the late Carlos Fuente Sr., who passed away in 2016. The two worked together for decades. The images are the idyllic representations of the man who Fuente Jr. looked up to the most. It becomes clear that the whole operation is a tribute to his father, and a giant shrine to his heritage and to his entire family history, which has more than 100 years in cigar making. Fuente Jr. expects the new factory to be complete by the end of the year. The grandeur and scale raise a question or two: What creative avenues will be left once this cigar-making Shangri-La is finished? Is it possible in the cigar business to have done it all? Maybe the questions are rhetorical. Maybe that little replica of his modest childhood home in Tampa is supposed to serve as a reminder of how far he’s come. Or an example of persistence and hard work. Whatever the case, this new grand factory, even unfinished, has already begun to take on a life of its own.